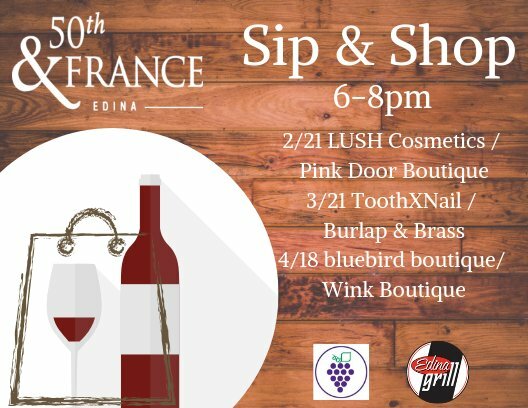 Grab some friends and come down to 50th & France on the upcoming third Thursdays for an evening of exclusive shopping while sampling our favorite beer and wines! We have partnered with Edina Grill and Beaujo's to bring pop-up sampling to our shops at 50th & France! These events are FREE to attend but are considered private shopping events. You may sign up for as many events as you would like to attend. Signing up grants you access to BOTH locations! Sign up HERE! The 2019 show date is April 13th at the Westin Galleria! 50th & France is proud to partner with Explore Edina, Galleria and Southdale Center for the fourth annual Style Edina fashion event promoting Edina as a retail destination. Enjoy mimosas, pop-up-shops and a fashion show with Stylist and Emcee Jodi Mayers and Co-Emcee Madeline Nachbar from Minneapolis St. Paul Magazine. Celebrate a community of style! Proceeds from the event will support the Edina Education Fund. The Education Fund secures private, supplemental funding to support valuable educational experiences and innovative projects in the Edina Public Schools. Learn more here about their work and programs. https://www.edinaedfund.org/about-us/about-education-fund/. Minneapolis St. Paul Magazine is our official print media partner. 50th & France shops are staying open later on Thursdays throughout the year. Stop by our shops and enjoy the cafe lights in the area as you wait for your dinner reservation, or grab an iced coffee from one of our coffee shops! A day of fun with the streets open for walking, biking, activities, food, music and more! Join us in 2019 for our 37th Annual Pumpkin Fest! If making dinner just isn't cutting it on a weekday or you want to make your weekday feel a little more special with an evening out, 50th & France restaurants have great specials earlier in the week! Arezzo Ristorante - Happy Hour weekdays 4-5 p.m. Ladies Nite Mondays with $15 Bottles of Pigro Wines. Beaujo's - Happy Hour Sunday-Thursday 4-6 p.m. Coalition - Social Hour is every day from 2:00 p.m. to 5:00 p.m.
Cocina del Barrio - Happy Hour Monday-Friday 3-6 p.m.
D'Amico & Sons - Early Dining Menu Monday-Saturday 4-5:30 p.m.
Red Cow - Two happy hours every day from 3-6 p.m. and 10 p.m. - close. INTENSATI: A high energy, cardio workout that is dynamic and rhythmic, yet easy to follow. This unique class combines martial arts, fitness aerobics, yoga, and spoken meditation to improve your health and tap into your inner potential. Every Monday 4-9 p.m. $15 bottles of Pigro wines.